Use this handy set to keep parts and tools from being misplaced or lost while working in the garage or at the workshop. Magnetic trays prevent items from rolling or sliding and can be used at any angle. Heavy duty, bright polished stainless steel resists rust and corrosion. 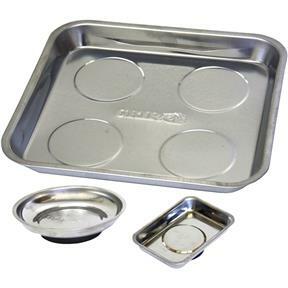 Includes - 9-1/2" x 10" magnetic parts tray, 4" round magnetic parts tray, and mini magnetic parts tray.